Don't forget to check out our other posts on Apple search ads for the latest best practices, tips and tricks, or bookmark our Apple search ads news updates page. #1 I'm not getting any impressions! Ensure that your total and daily spend limits are not exceeded. Raise your bid (try 2x, 3x, 4x, 5x baseline bid, but do it gradually over a period of 6-8+ hours in-between) (see Q #5 below). Expand your match types (see Q #6 below; exact match is the most restrictive, followed by broad, followed by search match, which is the least restrictive). Ensure your TTR is as high as possible (optimize our app listing, target dimensions that have the best performance, use exact match type). Ensure your keywords have sufficient search popularity. Try creating a new ad group or campaign. Per Apple's documentation, conversions are: "The total number of downloads or re-downloads resulting from a sponsored ad within the reporting period." Conversions are not launches, and sometimes may not be installs either, if the user interrupts or cancels the download/install process. Also: taps are Apple's term for clicks, as in the TTR (tap-through-rate). #3 How should I set my campaign structure up? A search match campaign, where the only target is search match (i.e. no bidded keywords). From this campaign, add all the keywords from your other campaigns as broad match negative, which will force search match to do what it does best: find brand new search combinations. From this, add negative keywords for searches that do not perform, and add performing search terms to your exact/broad match campaigns (and as new negatives to your search match campaign). Recommended budget allocation: 10-30% of total. A broad match campaign, where you only use broad match keywords. From this campaign, re-add all keywords as exact match negative keywords, which will force broad match to identify new/synonymous/related search combinations. Gradually add search terms as new negative keywords or to your exact campaign, according to performance. Recommended budget allocation: 20-40% of total. An exact match campaign, where you only use exact match keywords and no negative keywords are necessary. 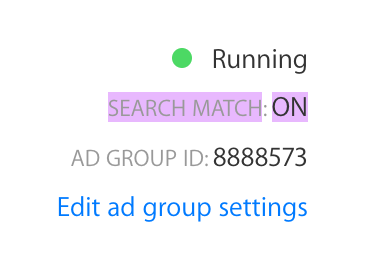 From your other two campaigns, add performing search terms as exact match here. Recommended budget allocation: 30-70% of total. #4 Why can't I add any more keywords? The total limit is not yet known, but we had issues trying to import a thousand keywords at once, and even several hundred. The upload limit is 200 keywords per batch. When we tried to add more than a few hundred, we began progressively receiving this error message, which is inaccurate, as we checked duplication status in the ad group and new keyword batch many a time. Edit 10/12: per an Apple search ads forum, the limits are reportedly 500 keywords per ad group and 2,000 keywords per campaign. "Keywords cannot be added because some of them already exist. Remove the duplicate keywords and try again." The maximum number of keywords we managed to add was 389. #5 How does the search auction work? #6 How do match types work? #7 Why are my installs not the same number in Search Ads vs my 3rd party attribution tool? This may be a discrepancy between downloads reported by Apple and installs reported by your 3rd party attribution tool. Contact your tool to raise the flag and get the issue resolved faster for all customers. #8 Why am I showing searches unrelated to my keywords? This is likely due to search match type, which is enabled by default. #9 How do I track in-app purchases? To set up custom attribution code in your app to track what users do after installing your app from a search ad. #10 How do negative keywords work? Negative keywords will block search queries from being eligible to match to your keywords and are a must for improving your search ad campaign ROI. There are two types of negatives: exact and broad match. Exact will block a search if the search query matches the negative keyword exactly. E.g. –[racing game] will block searches for racing game, but not racing car game or game racing. Broad will block a search, if all the individual words in the negative keyword are found, in any order in the search query. E.g. –racing game will block searches for racing game, racing car game and game racing, but not car games. Be careful when adding broad negatives, as A) they are the default if exact match is not specified and B) have the potential to block lots of traffic. #11 I don't have the time and/or the expertise to manage these campaigns. What do I do? If this is all greek to you, or you don't have the time to build and maintain a search ads campaign, contact us to discuss pricing for managing your search ads campaigns! Also, check out other FAQs from Apple's help page.